“We adopt to the ever-changing manufacturing world. We embrace these changes and look forward to the future. …I established Micro MIM Japan Holdings Inc. as a leading manufacturer to realise the use of μ-MIM® technology to keep pace with rapid changes in the manufacturing world. We are proud that the value of μ-MIM® technology meets the future trend of miniaturization. However, ongoing research and development remains crucial to determine our future technology and provide state-of-the-art technology to meet market needs, unhindered by a sole technology. Our company logo uses red, just like the Japanese national flag. Taisei Kogyo Co., Ltd. was established as a plastic injection moulding manufacturer in the 1970s and we have adapted metal injection moulding (MIM) technology based on our plastic moulding experience. 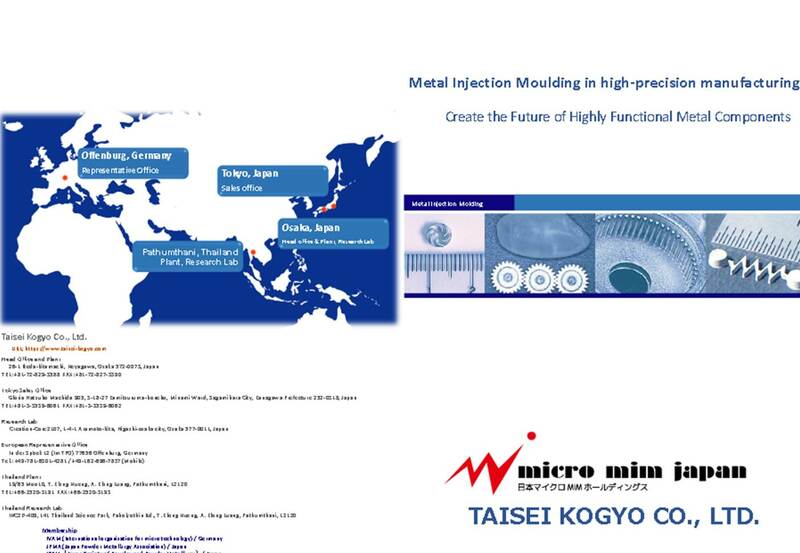 MIM technology was originally developed in the United States, since which time Taisei Kogyo has developed new-generation MIM, μ-MIM® technology, in Japan. We respect the invention and are grateful for the existing MIM technology. From now on, however, we would like to transmit our μ-MIM® technology as a Japanese company. This logo has a shape intertwined with an image letting you grab the future with your own hands. This hand also seeks a new form by repeating trials, with which we will positively explore the potential for new manufacturing enterprise in the market.